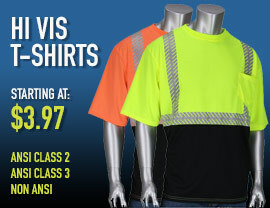 Find safety clothing that meets or exceeds ANSI standards to be in compliance for work and job safety. You will discover an extensive online catalog of safety vests, high visibility t-shirts, hi vis jackets, industrial rain gear and hi vis rain gear. We carry both imported and made in U.S.A. safety apparel and hi vis workwear providing our customers with outstanding value, wide selection and extremely competitive pricing. Just some of the reasons why the biggest names in energy, public safety organizations, fortune 500 companies and many small businesses place their trust in us. PPE (Personal Protection Equipment) from major brands is available at rock bottom prices. We carry top brands and manufacturers of safety clothing such as Occunomix, Majestic, PIP Dragonwear and many others that can be found on the safety gear brands page. Fall Protection equipment such as bodywear and harnessess, anchorage, lanyards and devices can also be found in our online catelog. Order online 24/7 or call us toll free, 877-999-4847, for assistance. Live customer service 8AM to 5PM E.S.T. Where Do I Find Occunomix Safety Clothing?